My sample provider site has two Lincoln speeches which I use to experiment with LTI consumers. 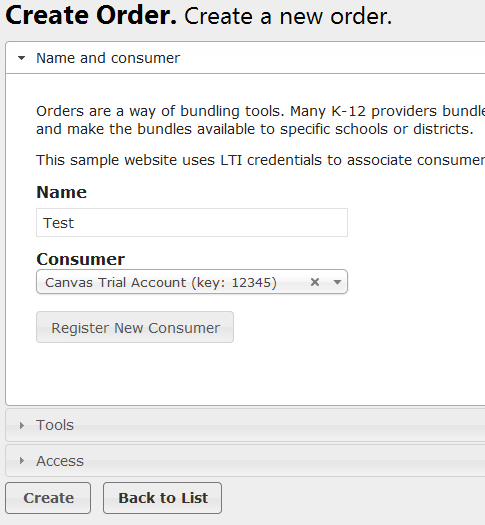 I signed up for a trial Canvas account yesterday and found out that the trial includes LTI consumer functionality. So, of course I started to add one of the Lincoln speeches. However, when I setup the external tool in Canvas, I noticed that my sample provider site made it unnecessarily difficult by asking for the tool_consumer_instance_guid (Canvas does not expose that value to the user). So I removed that requirement. Yeah for owning the code! Once that was gone, it was fairly straightforward. 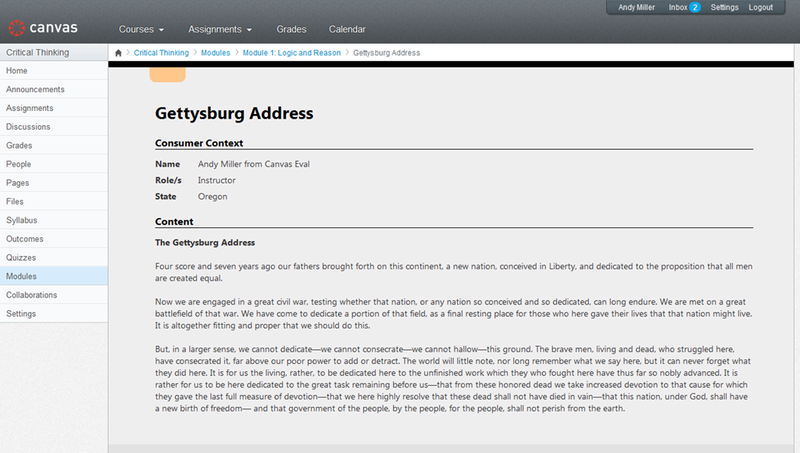 Here are (the now simple) steps to launch a Lincoln speech from Canvas with LTI. Login to your Canvas site. 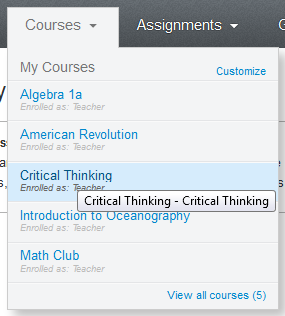 Select one of the courses. Select Settings from the navigation menu. Select the External Tools tab on the Settings page. Click on Add External Tool. Fill in all the fields as shown (using whatever key and secret you want) and then save the tool settings. In another window, login to http://provider.azurewebsites.net. 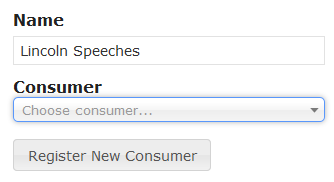 Give the order a name and then click on Register New Consumer. 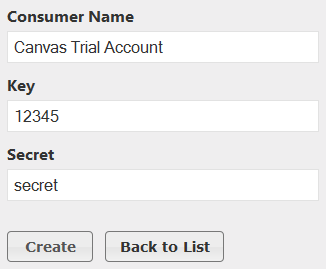 Fill in all the consumer fields, using the same key and secret as you used in Canvas, and then click on Create. Click on Create again to finish creating the order. Return to the Canvas course and select Home from the navigation menu. Add Content to one of the modules. 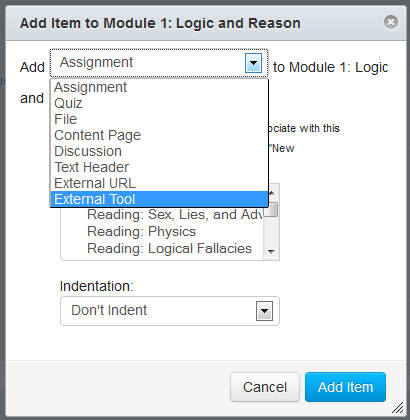 Choose the External Tool that you created above and then enter the URL to one of the Lincoln speeches. 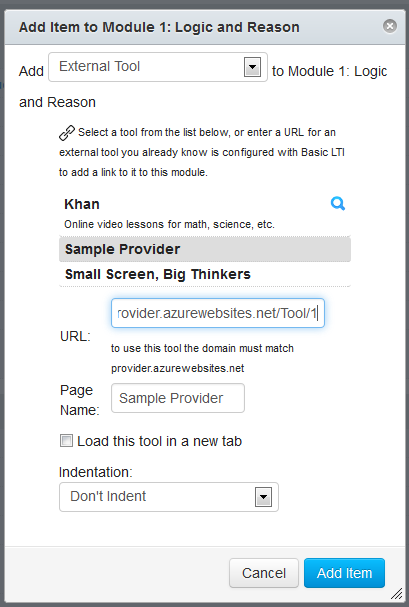 For example, http://provider.azurewebsites.net/Tool/1. Click on Add Item to save the new item. Click on the item to launch it. This entry was posted in Uncategorized and tagged Canvas, LTI. Bookmark the permalink.